Abstract | Fertilizers are an important agricultural input for improving crop productivity. However, chemical fertilizers are prone to losses and fixation thereby decreasing the nutrient use efficiency. Plant growth promoting rhizobacteria (PGPR) can be applied to improve the growth and yield by improving nutrient availability to crop plants. A field experiment was carried out to determine the effect of seed inoculation with PGPRs on yield and quality of different genotypes of soybean. Seed inoculation treatments [control (no treatment), nitrogen fixing bacteria (Rhizobium japonicum) and phosphorus solubilizer (Pseudomonas fluorescens)] were applied to three different cultivars of soybean (EBR4V4, Freedom and Swat-84). The results showed that seed inoculation with R. japonicum and P. fluorescens improved the grain yield, biological yield, oil content and protein content of soybean, as compared to un-inoculated control. Seed inoculation with P. fluorescens was more effective than R. japonicum in improving grain yield and quality. The genotypes did not differ significantly in grain yield, biological yield and oil content; however, differed in protein content. Swat-84 was superior among all genotypes pertaining to yield formation and protein content. In conclusion, seed inoculation with R. japonicum and P. fluorescens improved the yield and quality of soybean genotypes thus could be employed to improve the soybean productivity. Citation | Yousaf, S., A. Zohaib, S.A. Anjum, T. Tabassum, T. Abbas, S. Irshad, U. Javed and N. Farooq. 2018. Effect of seed inoculation with plant growth promoting rhizobacteria on yield and quality of soybean. 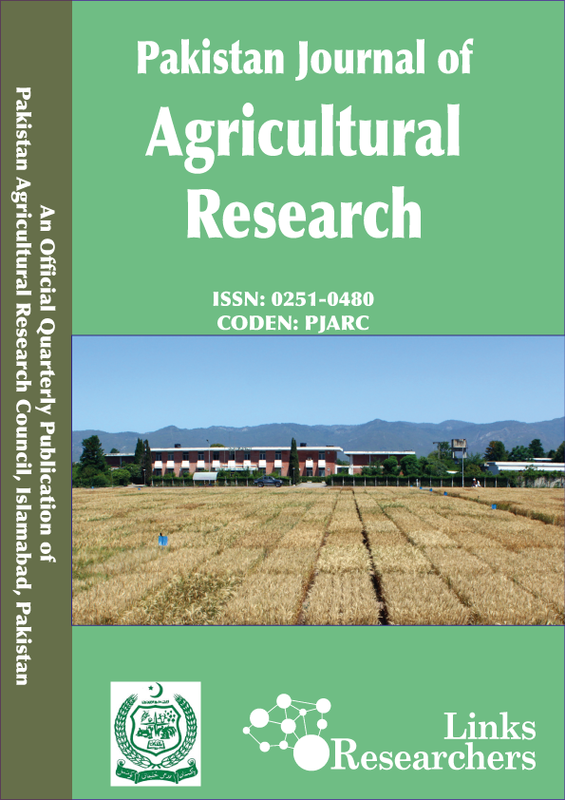 Pakistan Journal of Agricultural Research, 32(1): 177-184. Pakistan is facing a severe shortage of edible oil. The local production of edible oil is just 0.50 million tons which is only 20% of total requirement of country. In the year of 2016-17, Pakistan imported 1.94 million tons of edible oil worth Rs. 155.3 billion to fulfill the total requirement of 2.45 million tons (GoP, 2018). Soybean is the oldest oilseed crop in world and belongs to Fabaceae family. It is grown all over the world in tropical, sub-tropical and temperate climates (Ibrahim, 2012). It provides oil (20-22%), protein (40-45%) and carbohydrates (20-26%) in addition to some nutrients and vitamins (Ahmad et al., 2010). Among various factors responsible for low yield of soybean, less varietal adaptability (MINFAL, 2006), lack of proper nutrient management and seed inoculation with PGPRs are of much importance (Okereke et al., 2004). Plant nutrition more often affects seed production and quality, as well as seed protein and oil contents and yield of oilseed crops (Zohaib et al., 2018a, b). Nitrogen and phosphorus are essential macronutrients that are required in large quantities for crop growth and development. Nitrogen is an essential constituent of proteins and vitamins, involved in photosynthesis, helps in production and usage of carbohydrates, and required for energy reactions of plants as well (Sara et al., 2013). A large amount of phosphorus is required by legumes for their growth, yield and nodulation (Mir et al., 2013). However, despite of substantial amount of total phosphorus in tropical soils, deficiency of phosphorus is an important fertility problem due to its fixation in soil (Haru and Ethiopia, 2012). Also, there is a wide gap between the production and supply of fertilizers, especially nitrogenous fertilizers. Nutrient losses through runoff, leaching and volatilization add to the environmental pollution (Zuazo et al., 2004; Choudhury and Kennedy, 2005). However, following proper seed inoculation with PGPR such as Rhizobium and Pseudomonas species can improve yield of soybean through biological nitrogen fixation (BNF) and making available the held up phosphorus through its solubilization (Tagore et al., 2013; Argaw and Muleta, 2018). Seed inoculation is an effective way for improving the productivity of legumes (Murtaza et al., 2014). When soybean roots are infected by the appropriate Rhizobium strain, nodules are generally formed with regard to their potential for BNF (Shu-Jie et al., 2007). It is an established fact that yield of legumes increases significantly by seed inoculation with suitable strain of bacteria (Beauchamp et al., 1996). Several studies have reported an increase in yield and quality of legumes by seed inoculation with Rhizobia (Tomar et al., 2004; Shahid et al., 2009). Some phosphorus solubilizing bacterial species such as Pseudomonas solubilize insoluble inorganic phosphorus compounds, induce the production of hormones, makes trace elements available and increase nitrogen fixation rate (Gull et al., 2004). An increase in phosphorus availability to crops, and enhanced growth and yield of legumes have been documented in various studies by seed inoculation with Pseudomonas sp. (Singh and Pareek, 2003; Rudresh et al., 2004). There exists a variable varietal behavior of soybean pertaining to the crop growth, yield and quality (Ali et al., 2004; Ngalamu et al., 2013). This differential behavior of different genotypes to applied inputs indicates the necessity of selection of suitable genotype under certain circumstances in order to obtain higher crop yield and quality (Murtaza et al., 2014; Argaw and Muleta, 2018). Therefore, there is a dire need to explore the high yielding genotypes with better adaptability for maximizing crop production. Moreover, different bacterial strains differ in their ability for nodulation and biological nitrogen fixation depending on the host genotype (Aguilar et al. 1998; Farid and Navabi, 2015). Likewise, the efficacy of phosphorus solubilizing bacteria differs with host genotype which affects the phosphorus availability and yield of crop plants (Tagore et al., 2013). The PGPRs improve the crop yield and quality. However, the comparative effect of different PGPRs on yield and quality of different genotypes of soybean has been seldom studied. Thus the present study was carried out with objectives to investigate the influence of seed inoculation with nitrogen fixing bacteria or phosphorus solubilizing bacteria on yield and quality of different genotypes of soybean under semi-arid conditions of Faisalabad. A field study was carried out to evaluate the effect of seed inoculation with PGPRs on yield and quality of soybean at Agronomic Research Area, University of Agriculture, Faisalabad, during 2013. The experimental soil belongs to Lyallpur soil series (aridisol, hyperthermic Ustalfc), Haplic Yermosols and Haplarged according to FAO and USDA classification, respectively. The soil was low in organic matter and medium in soil fertility. The physico-chemical characteristics of the experimental site are presented in Table 1. The experiment was laid out in randomized complete block design in factorial arrangement with three replications. The net plot size was 5.0 m × 2.4 m. Seed inoculation treatments viz. control (no treatment), nitrogen fixing bacteria (Rhizobium japonicum) and phosphorus solubilizer (Pseudomonas fluorescens) were applied to three different soybean genotypes viz. EBR4V4, Freedom and Swat-84. The inoculants (Rhizobium japonicum and Pseudomonas fluorescens) were obtained from Ayub Agricultural Research Institute (AARI), Faisalabad. Seed inoculation was done by moistening the seed with 5% sugar solution followed by spreading the inoculant over seed and mixing thoroughly. The inoculant was applied at the rate of 250 g per 20 kg seed according to the nature of treatment. The control was not inoculated. The crop was sown in last week of February with the help of hand drill at 30 cm spaced rows and 10 cm spaced plants within rows with seed rate of 100 kg ha-1. Fertilizer was applied at the rate of 25 kg ha-1 N, 50 kg ha-1 P2O5 and 50 kg ha-1 K2O at the time of sowing. Six irrigations were applied during the whole growth period of crop till maturity. Thinning of crop was done 30 days after crop emergence to maintain the desired plant population. Three hoeing’s were done to ensure optimum control of weeds in crop. Harvesting was done manually with the help of sickle in last week of June. Harvested crop was tied into bundles and allowed to dry in the field to lower the moisture level up to 12% and threshed manually. The weather data prevailing at field during the growing season of soybean is presented in Figure 1. Table 1: Physico chemical characteristics of experimental soil. The collected data of all parameters was analyzed by using Fisher’s analysis of variance (ANOVA) technique and Tukey’s honest significance difference (HSD) test was used to compare the treatments’ means at 5% probability level (Steel et al., 1997). The genotypes significantly differed in number of pod bearing branches per plant, number of pods per plant and 1000-grain weight while did not differ in number of grains per pod, grain yield and biological yield of soybean (Table 2). Highest number of pod bearing branches per plant (3.11) and number of pods per plant (90.48) were produced by EBR4V4. However, highest 1000-grain weight (84.31 g) of soybean was produced by Swat-84 (Table 2). The influence of seed inoculation on number of pod bearing branches per plant, grain yield and biological yield was significant. However, number of pods per plant, 1000-grain weight and number of grains per pod were not affected significantly by seed inoculation (Table 2). Highest number of pod bearing branches per plant (2.71), grain yield (2432 kg ha-1) and biological yield (9046 kg ha-1) of soybean were produced by seed inoculation with P. fluorescens. However, R. japonicum exhibited similar effect on number of pod bearing branches per plant (2.67) and grain yield (2272 kg ha-1) (Table 2). Table 2: Influence of seed inoculation with plant growth promoting rhizobacteria of different genotypes of soybean on yield related attribute, yield and seed quality. Table 3: Interaction effect of seed inoculation with plant growth promoting rhizobacteria and genotypes on yield related attributes and seed protein content of soybean. Interaction of genotypes and seed inoculation was significant for number of pod bearing branches and number of pods per plant; while, non-significant for 1000-grain weight, number of grains per pod, grain yield and biological yield (Table 2). Highest number of pod bearing branches per plant (3.40) and number of pods per plant (97.73) were obtained by seed inoculation of EBR4V4 with R. japonicum. However, seed inoculation of EBR4V4 with R. japonicum as well as seed inoculation of EBR4V4 and Freedom with P. fluorescens produced statistically similar number of pod bearing branches per plant. Similarly, number of pods per plant was statistically similar when EBR4V4 was inoculated with R. japonicum and P. fluorescens (Table 3). In present study, the genotype Swat-84 produced non-significantly highest grain yield (10 and 75 kg ha-1 greater than EBR4V4 and Freedom, respectively) which was associated with more number of grains per pod and 1000-grain weight (Table 2) though the number of pod bearing branches and pods per plant (Table 2 and 3) were less, as compared to other genotypes. This differential response of genotypes pertaining to yield formation might be due to their differential genetic behavior (Ayub et al., 1999; Ngalamu et al., 2013). In Swat-84, higher number of grains per pod and grain weight might be associated with high translocation rate of assimilates to fruiting structures and grains. Previous studies have reported similar differences in yield and yield attributes of different genotypes of mungbean (Ayub et al., 1999; Sharar et al., 1999). In present study, seed inoculation with PGPRs significantly enhanced the number of pod bearing branches and number of pods per plant (Table 2 and 3), while non-significantly enhanced number of grains per pod (Table 2). However, seed inoculation with PGPRs did not affect 1000-grain weight as compared to control (Table 2) which indicates that PGPRs mainly affected the number of grains per plant (calculated from Table 2) rather than grain weight. The improvement in yield attributes of soybean by seed inoculation with PGPRs might be attributed to enhanced growth and development to plants due to improved availability of nitrogen and phosphorus (Mamta et al., 2010; Qureshi et al., 2012). Similar improvement in yield attributes has been reported due to seed inoculation of soybean with Rhizobium sp. (Malik et al., 2006; Shahid et al., 2009) and groundnut with Fluorescent Pseudomonads (Shweta et al., 2008). In present study, the increase in grain yield (Table 2) by seed inoculation with PGPRs was the result of increase in number of pod bearing branches per plant and pods per plant (Table 2 and 3). Our results are supported by findings of Ali et al. (2004) who reported an increase in grain yield of different genotypes of mungbean by the influence of seed inoculation with nitrogen fixing bacteria (Rhizobium loti). Similarly, Shweta et al. (2008) reported a significant increase in grain yield of groundnut by seed inoculation with phosphorus solubilizing bacteria (Fluorescent Pseudomonads). The improved biological yield (Table 2) of soybean may be because of enhanced photosynthetic activity due to enhanced availability and uptake of nitrogen and phosphorus by the activity of plant growth promoting rhizobacteria (Habashy, 2005). Previous studies have reported an increase in the biological yield by seed inoculation of mungbean with Rhizobium sp. (Tahir et al., 2011) and Stevia rebaudiana Bertoni with phosphorus solubilizing bacteria (Burkholderia gladioli and Enterobacter aerogenes) (Mamta et al., 2010). Genotypes of soybean did not differ in grain oil content but differed in protein content. Maximum grain protein content was produced by Swat-84 (40.13%) (Table 2). However, effect of seed inoculation on grain oil content and protein content was significant. Maximum oil content (19.39%) and protein content (40.81%) of soybean was produced by seed inoculation with P. fluorescens. However, grain oil content was statistically similar when inoculated with P. fluorescens as well as R. japonicum (Table 2). The interaction of genotypes and seed inoculation was non-significant for grain oil content while significant for protein content (Table 2). Highest grain protein content (41.54%) was produced by Swat-84 when inoculated with P. fluorescens (Table 3). Swat-84 produced highest grain protein content which might be due to high uptake and translocation of nitrogen to grains in this genotypes as compared to other genotypes. In present study, higher grain oil content (Table 2) and protein content (Table 2 and 3) of soybean due to seed inoculation with R. japonicum (nitrogen fixing bacteria) and P. fluorescens (phosphorus solubilizing bacteria) may be attributed to enhanced uptake and translocation of nitrogen and phosphorus to grains (Qureshi et al., 2012). Previous studies have reported similar increase in grain oil and protein contents of soybean by Rhizobium seed inoculation, as compared to untreated control (Sable et al., 1998; Sunita et al., 1998). Similarly, Ekin (2010) and Panhwar et al. (2013) reported an increase in grain oil content in sunflower and protein content in aerobic rice, respectively. The results showed that seed inoculation with R. japonicum or P. fluorescens effectively enhanced the yield and quality of different genotypes of soybean. Seed inoculation with P. fluorescens was more effective than R. japonicum in improving yield and quality of soybean. In conclusion, seed inoculation with R. japonicum or P. fluorescens improved yield and quality of soybean crop over un-inoculated and could be used for improving the crop yield and quality of produce. Saima Yousaf conducted experiment and collected data. Ali Zohaib performed statistical data analysis, prepared the write up and did overall management of article. Shakeel Ahmad Anjum supervised the study and gave technical input at every step. Tahira Tabassum wrote abstract and collected literature. Tasawer Abbas reviewed the article. Sohail Irshad helped in data analysis. Usman Javed contributed in conclusion while Naila Farooq helped in references. AOAC. 1995. Association of official analytical chemists. Official methods of analysis, 16th ed. AOAC Int. Wash. D.C. USA. Ahmad, M.S., M.M. Alam and M. Hasanuzzaman. 2010. Pod development in different soybean (Glycine max L. Merril) varieties as affected by sowing dates. Am. Euras. J. Sci. Res. 5(3): 183-186. Ali, H., M.A. Khan and S.A. Randhawa. 2004. Interactive effect of seed inoculation and phosphorus application on growth and yield of chickpea (Cicer arientinum). Intl. J. Agric. Biol. 6(1): 110-112. Beauchamp, E.G., D.J. Hume, J.E. Ferguson, D. Young and R.W. Sheard. 1996. Nitrogen credit for crops following soybean or other crops. Report to ontario soil, water and air research and service committee. Guelph, Canada: Land Res. Sci. Dep. Univ. Guelph. Bremner, J.M. 1964. Ammonium production in soil under waterlogged conditions as an index of nitrogen availability. Nat. 20: 951-952. Ekin, Z. 2010. Performance of phosphate solubilizing bacteria for improving growth and yield of sunflower (Helianthus annuus L.) in the presence of phosphorus fertilizer. Afr. J. Biotech. 9(25): 3794-3800. GoP. 2018. Economic survey of Pakistan. Ministry of finance, Islamabad, Pakistan. Habashy, N.R. 2005. A comparative study for phosphorus form or applied methods and their effect on tomato fruit yield and its quality in a calcareous soil. Egypt J. Appl. Sci. 20: 290-304. Ibrahim, S.E. 2012. Agronomic studies on irrigated soybeans in central Sudan: II. Effect of sowing date on grain yield and yield components. Int. J. Agric. Sci. 2(9): 766-773. MINFAL. 2006. Agriculture statistics of Pakistan. Ministry of food, agriculture and livestock, economic wing, GOP, Islamabad. Mir, A.H., S.B. Lal, M. Salmani, M. Abid and I. Khan. 2013. Growth, yield and nutrient content of blackgram (Vigna mungo) as influenced by levels of phosphorus, sulphur and phosphorus solubilizing bacteria. Saarc J. Agric. 11(1): 1-6. Murtaza, G., Ehsanullah, A. Zohaib, S. Hussain, T. Rasool and H. Shehzad. 2014. The influence of rhizobium seed inoculation and different levels of phosphorus application on growth, yield and quality of mashbean (Vigra mungo L.). Int. J. Mod. Agric. 3(1): 92-96. Panhwar, Q.A., O. Radziah, U.A. Naher, A.R. Zaharah, M.I. Razi and J. Shamshuddin. 2013. Effect of phosphate-solubilizing bacteria and oxalic acid on phosphate uptake from different P fractions and growth improvement of aerobic rice using 32P technique. Aust. J. Crop Sci. 7(8): 1131-1140. Qureshi, M.A., A. Iqbal, N. Akhtar, M.A. Shakir and A. Khan. 2012. Co-inoculation of phosphate solubilizing bacteria and rhizobia in the presence of L-tryptophan for the promotion of mash bean (Vigna mungo L.). Soil Environ. 31(1): 47-54. Sable, S., P.Y. Sontakey, R. Tagade, R.D. Deotale and P. Mnanpure. 1998. Effect of Rhizobium and molybdenum on quality aspects, yield and yield contributing characters of Soybean. J. Soils Crops 8(2): 157-159. Shahid, M.Q., M.F. Saleem, H.Z. Khan and A.A. Shakeel. 2009. Performance of soybean under different phosphorus levels and inoculation. Pak. J. Agric. Sci. 46(4): 29-33. Shweta, B., D.K. Maheshwari, R.C. Dubey, D.S. Arora, V.K. Bajpai and S.C Kang. 2008. Beneficial effects of Fluorescent pseudomonas on seed germination, growth promotion, and suppression of charcoal rot in groundnut (Arachis hypogea L.). J. Microbiol. Biotechnol. 18: 1578-1583. Singh, B. and R.G. Pareek. 2003. Studies on phosphorus and bio-inoculants and biological nitrogen fixation, concentration, uptake, quality and productivity of mungbean. Ann. Agric. Res. 24: 537-541.
characters of soybean. J. Soil Crops. 8(2): 157-159. Tagore, G.S., S.L. Namdeo, S.K. Sharma and N. Kumar. 2013. Effect of Rhizobium and phosphate solubilizing bacterial inoculants on symbiotic traits, nodule leghemoglobin, and yield of chickpea genotypes. Int. J. Agron. 581627. Tahir, M., A. Ali, Noor-ul-Aabidin, M. Yaseen and H.U. Rehman. 2011. Effect of molybdenum and seed inoculation on growth, yield and quality of mungbean. Crop Environ. 2(2): 37-40. Rhizobium inoculation on growth, yield and quality of soybean. Prog. Agric. 4(1): 72-73.